Looking for cheap calls to Mexico? 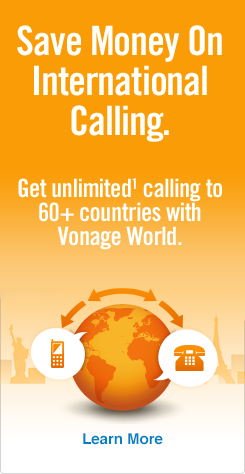 Get unlimited¹ calling to Mexico with Vonage World Mexico Sin Límites! Introducing Vonage World Mexico Sin Límites! With Mexico Sin Límites, you can make unlimited¹ calls to Mexico mobiles as much as you want for one low, monthly rate! It’s finally here, cheap calls to Mexico without limits! Unlimited¹ calling to Mexico landlines as well as 60 other countries! Unlimited¹ mobile calling to Mexico and 10 other countries! Unlimited¹ home phone service (local and long distance) across the U.S., Canada and Puerto Rico. Vonage Extensions® — extend your calling plan to another phone, even a U.S. mobile, FOR FREE. Vonage World Mexico Sin Límites is the only Mexico calling plan you’ll need to call Mexico unlimited¹. Whether it’s landlines or mobiles, Toluca de Lerdo or Ecatepec City, Mexico Sin Límites has you covered when it comes to international calls to Mexico. And speaking of calls, brush up on how to call Mexico with our post on dialing instructions, with calling codes to all major Mexican cities, no matter what state they’re in. Now when you make a call to Mexico about that mole recipe, you’ll never have to watch the clock. Get unlimited¹ calls to Mexico, landlines and mobiles, with Vonage World Mexico Sin Limites today, the only plan for calling Mexico you need!